In your practice, you will find clients/patients with an ADHD diagnosis who prefer not to take medication. There are various reasons for this - and in this seminar recording you will learn these reasons, and you will learn what other treatment options are available. The more you know the “whys” of your client’s choice of treatment, the better quality of care you can provide them. You will learn about the medications available for treating ADHD, including the benefits and side effects. You will learn the myths surrounding medication, and how to help your client/patient make the most informed choice about their treatment. Not only will you learn the most common non-medication treatments for ADHD in this seminar recording, you will also learn the safety and efficacy of each treatment. This information is very valuable when considering referring a client/patient for ADHD treatment. You will also learn how much these treatments cost, and if the possible benefits outweigh the financial impact on the client/patient. The use of nutraceuticals/supplements will be discussed - both how they can impact the central nervous system and why it is important to find a producer with good quality assurance. You will also learn how diet can make a difference in treating ADHD - but not in the way you might think. You will also learn more about the research purporting a link between pesticides and ADHD. 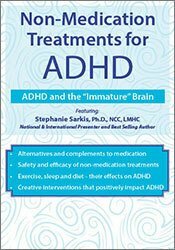 Dr. Sarkis, a psychotherapist and published author with more than 15 years of experience in treating ADHD, will show you the path to determining the best ADHD client/patient treatment. through the Institute of Certified ADHD Professionals at https://www.adhdcert.com. Stephanie Sarkis, Ph.D., NCC, LMHC, is the best-selling author of five books: Natural Relief for Adult ADHD: Complementary Strategies for Increasing Focus, Attention, and Motivation With or Without Medication (2015); 10 Simple Solutions to Adult ADD: How to Overcome Chronic Distraction & Accomplish Your Goals (2nd edition, 2011); Adult ADD: A Guide for the Newly Diagnosed (2011); ADD and Your Money: A Guide to Personal Finance for Adults with Attention Deficit Disorder (2009); and Making the Grade with ADD: A Student’s Guide to Succeeding in College with Attention Deficit Disorder (2008). Dr. Sarkis is an American Mental Health Counseling Association Diplomate and Clinical Mental Health Specialist in Child and Adolescent Counseling. She is a blogger for Psychology Today and The Huffington Post, where she writes about pediatric anxiety, depression and ADHD. She is also a National Certified Counselor (NCC) and Licensed Mental Health Counselor (LMHC), with private practices in Boca Raton and Tampa, Florida. She is also the founder of the Sarkis Institute, which specializes in anxiety related to chronic pain issues. In 2001, she received an American Psychological Association Outstanding Dissertation Award for her research on executive functions and their impact on pediatric comorbid ADHD, including anxiety disorders. Dr. Sarkis has been published numerous times, including in the Journal of Attention Disorders, the National Psychologist, and The ADHD Report. She has presented numerous venues, including ACA, CHADD, ICP, and PESI. She has made several medial appearances, including CNN “Health Minute”, ABC News, Fox News, Sirius Satellite Radio, Woman’s Day and First Business Television. Dr. Sarkis is featured in the book, The Gift of Adult ADD by Lara Honos-Webb, Ph.D. Dr. Sarkis, in conjunction with the American Deficit Disorder Association (ADDA), created the Moulton-Farnsworth Scholarship for college students with ADHD. Dr. Sarkis’ website is www.stephaniesarkis.com. Financial: Stephanie Sarkis has books published by New Harbinger Publications and receives royalties. She writes blogs for Psychology Today and Huffington Post. She receives a speaking honorarium from PESI, Inc. Non-financial: Stephanie Sarkis is on the Professional Advisory Board of Children and Adults with Attention Deficit Hyperactivity Disorder (CHADD). PESI, Inc. is an AOTA Approved Provider of continuing education. Provider #: 3322. This self-study course qualifies for 6.0 self-study contact hours or .6 CEUs in the Category of Domain of OT and Occupational Therapy Process. The assignment of AOTA CEUs does not imply endorsement of specific course content, products, or clinical procedures by AOTA. Course Level: Intermediate. Expires: 10/15/2019.